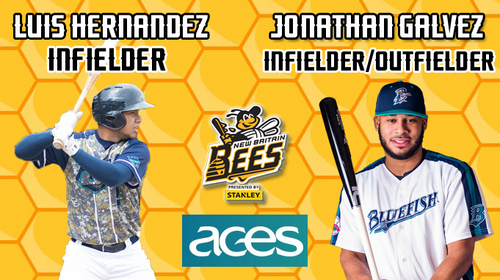 (New Britain, Conn., Feb. 20, 2018) – The New Britain Bees today announced the signings of infielder Luis Hernandez and infielder/outfielder Jonathan Galvez. Luis Hernandez joins the Bees for his third season in the Atlantic League and 16th of professional baseball. Last year, the former big leaguer played in 120 games for the Bridgeport Bluefish, finishing the season with a .280 batting average, five home runs, 46 RBI, 58 runs scored, and 12 stolen bases, while being named an Atlantic League All-Star. During his Atlantic League debut in 2016 with the ‘Fish, he was named to the Post-Season All-Star Team as well as the Red, White, & Blue All-Defensive Team after recording a .967 fielding percentage at shortstop, while also collecting 200 put outs and a league-leading 389 assists. The 33-year-old made his professional debut in 2002 after being signed by the Atlanta Braves as an undrafted free agent. He made his Major League debut with the Baltimore Orioles in 2007, where he spent two campaigns before being traded to the Kansas City Royals in 2009 and then the New York Mets in 2010. He also made a brief appearance with the Texas Rangers in 2012. In 122 career big league games, Hernandez owns a .243 batting average with three home runs, 20 RBI, and 22 runs scored. In 1,467 career minor league games, Luis owns a .259 batting average with 39 home runs, 550 RBI, 624 runs scored, 94 stolen bases, and a sterling .970 fielding percentage as shortstop. Jonathan Galvez heads to New Britain for his fourth season in the Atlantic League and 11th of professional baseball. The infielder/outfielder spent the last three seasons with the Bridgeport Bluefish, including an impressive 2017 campaign, where he batted .277 with 16 home runs, 27 doubles, 77 RBI, 68 runs scored, 10 stolen bases, and a .351 on-base percentage over the course of 126 games played. He also represented the ‘Fish and the Liberty Division in the 2016 Atlantic League All-Star Game. The 27-year-old began his professional career in 2008 within the San Diego Padres organization. He spent seven years in the Padres farm system, reaching Triple-A in both 2013 and 2014. The slugger also spent time with both the Mets and Yankees organizations in 2015. In 961 career minor league games, Galvez owns a .277 batting average with 81 home runs, 495 RBI, 551 runs scored and 141 stolen bases.